Mother’s Day is just around the corner and finding the right gift for the maternal figure in your life can be hard. 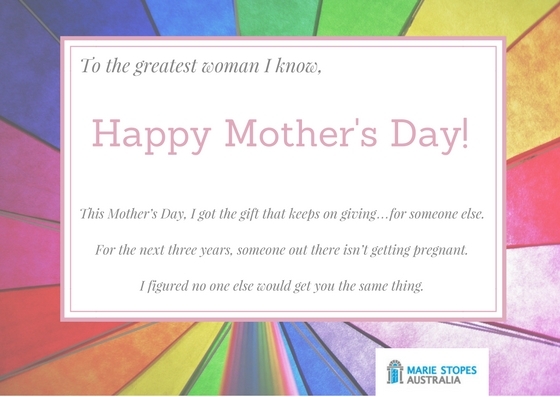 At Marie Stopes, we’re all about making life easier for Australian women who are making tough decisions. 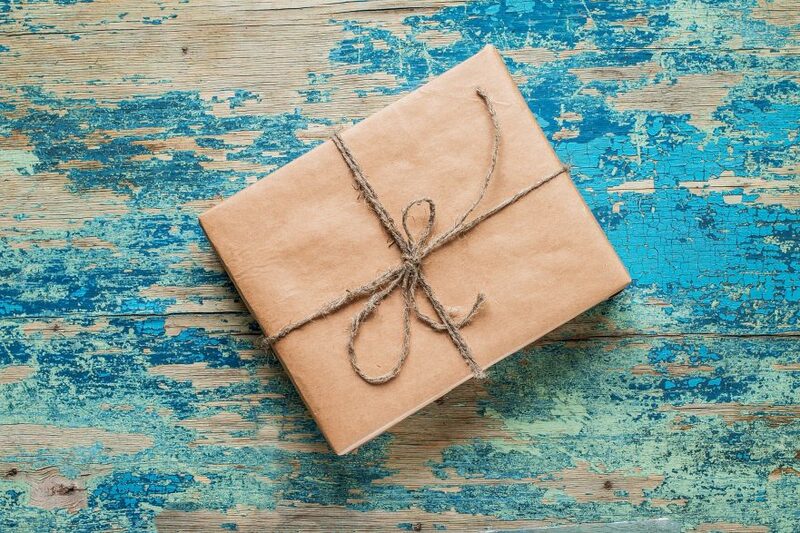 So this year, we’ve put together the perfect gift list! Surprise your mum or mum-figure with something we guarantee she doesn’t already have! 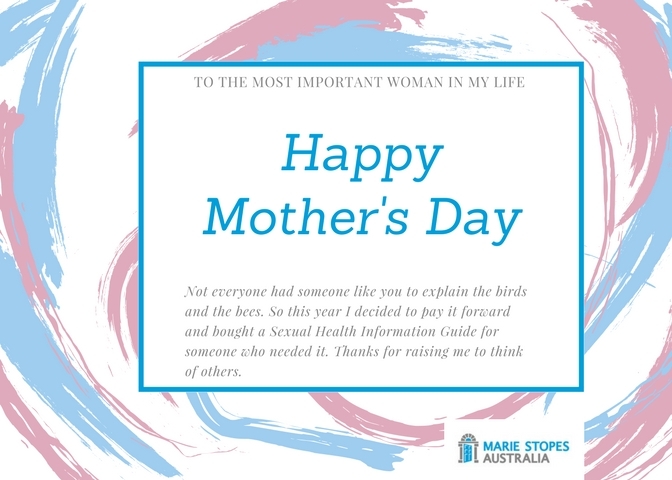 Make a donation to Marie Stopes for Mothers Day and in doing so you’ll be providing contraception access to Australian women facing financial hardship. 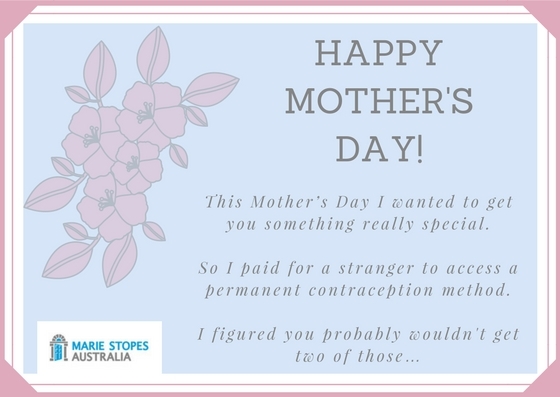 We’ve made it even easier by pre-writing your Mother’s Day card for you! 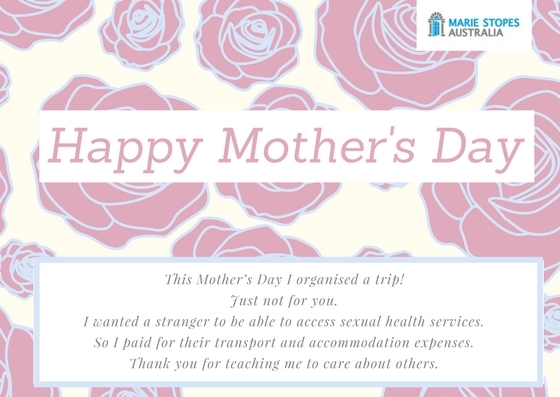 Once you’ve donated, feel free to download your eCard and email it through to Mum, or get bonus points by printing it out and mailing it to her. A $2 donation is enough for us to be able to provide a condom to someone who doesn’t have access to any. This comes with education around how to use them properly, which not only helps to prevent pregnancy, but also STIs. And after all, mum always said to play safe, so really you’re just passing on her advice; what mum doesn’t love that? Diversity is the spice of life, and female condoms are an awesome alternative to the conventional condom. For $5 we can provide someone with access and information about a female condom. They provide protection from STIs and pregnancy. For some people, a conventional condom isn’t a possibility, which means the female condom is their only option for barrier protection. Reliable information about sexual health can be hard to come by. 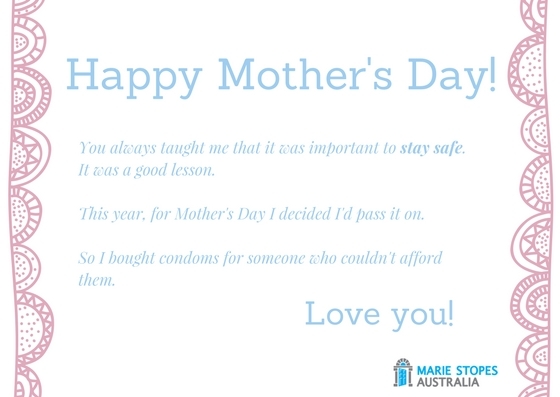 At Marie Stopes we like to make sure that everyone is informed about their body and their health, and for $10 we can produce sexual health information guides that help to do just that. Everyone with a cervix is at risk of cervical cancer, and the best way to prevent it is to have regular screenings. 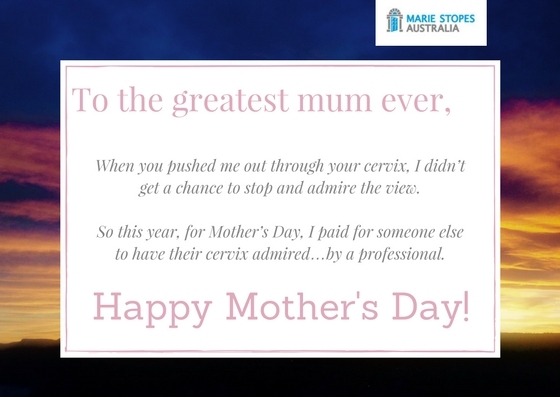 For $20 we can provide a cervical screening for someone who needs it. Depot Medroxyprogesterone Acetate might sound like the latest discovery at a paleontological dig, but in fact it’s a nifty contraceptive method delivered via injection. For $30 we can provide one injection that will keep someone protected against an unplanned pregnancy for 3 months. The contraceptive implant is a reliable method of long acting, reversible contraception. It’s inserted into the upper arm and prevents unwanted pregnancies for 3 years. It can be removed at any time without having any effect on fertility. Now that’s a gift that keeps on giving! An Intra-Uterine Device is a form of long acting, reversible contraception and can last up to a decade. Talk about value for money! The IUD sits in the uterus and prevents pregnancy. If you want to know more, check out our 9 Facts about Copper IUDs. 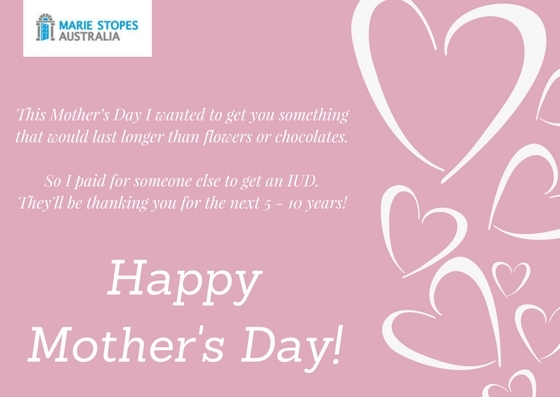 If you want to help someone out, a donation of $100 helps us provide the intrauterine device to someone who needs it. Sadly not everyone has access to a local clinic where they can access sexual and reproductive healthcare. This means that even a simple procedure such as the insertion of a contraceptive implant can involve travelling a very long distance, and even arranging for accommodation. A donation of $200 goes a long way towards helping remote and rural women access our services. For those people who are certain that they don’t want to have more, or any, children there’s the option of permanent contraception. This can be done through tubal ligation or vasectomy. Both options have an over 99% efficacy rate and will help to prevent pregnancy for the rest of someone’s life. If you want to completely change someone’s life, a donation of $500 helps us to provide this procedure for someone who needs it.